Jerry Kellman is a plain, soft-spoken man in his sixties. He has been, and done, many things. Born in New York, he retains some of the accent, but he moved to Chicago many moons ago. Born Jewish, he converted to Catholicism, also many moons ago. Kellman is a professional community organizer. He learned his trade at a school run by Saul Alinsky. He then mentored other community organizers, including Barack Obama. Kellman is also a professional lay minister. He earned his M.Div. from my alma mater, Loyola University Chicago. On Pentecost weekend, Kellman talked at my parish. He said Pentecost is one of those days you know is important, but you don’t necessarily feel is important. It’s not Christmas or Easter. One reason we’re told it’s important is because it’s “the birthday of the church.” But why give Pentecost the credit for that? From the scriptures and the historical record, we know that “Jesus communities” were in place during Jesus’ lifetime. Those groups already did much of what they would do later. They had the table fellowship of the “breaking of the bread.” They emphasized the giving and receiving of forgiveness. They shared property and resources for the community’s benefit. Kellman told us two catalysts transformed these Jesus communities into something new. Number one was that through, with and in Jesus, these communities had an experience of dying and rising. His Paschal Mystery was theirs. Number two, and hence “the birthday of the church,” was the arrival of the Spirit. Kellman emphasized that the point was not to define what arrival meant, or who the Spirit was. The point was to describe what the experience looked like. When you knew that, you would know when the Spirit was present, and how vital this presence was. 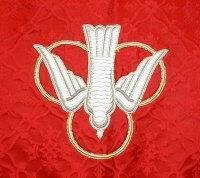 First, he said, the Holy Spirit moved within and among the community. It was, in other words, important that the disciples were gathered in the Upper Room. The Spirit did not come to individual disciples off in a corner somewhere. Second, the Spirit overwhelmed them, knocked them off their feet. And third, the Spirit gave them power to do things for themselves, for each other, and for the wider world. It was a power they’d never had before, to do things they’d never done before. Finally, Kellman told us, it was still going on. It was still going on in the wider church, and in parishes like ours. And here was his special area of expertise: it was still going on in the local communities to which our parishes belonged, as long as we were willing to embrace the nitty-gritty around us. None of the foregoing was uttered with any flourish. Kellman’s delivery was as stripped-down and bullet-point as the one I’ve just given you. No gale burst through our stained glass windows with a raging flamethrower as a chaser. But his was as good a description of what the church does, and of what the Spirit does, as any I’ve ever heard. When it was over, I wanted to be one of those bread-breaking, all-sharing, dead-and-risen people, knit into a community that is in the express business of doing what has never been done before. My desire was not a flash of lightning or a “retreat high.” It was simple and direct. Now, like the Apostle Paul, I have handed on to you what I myself have received. And I hope you have a simple, direct desire to be one of those people with me. This entry was posted in Spirituality and tagged Catholic Church, Christian life, Holy Spirit, Pentecost, spirituality, theology by Justin Sengstock. Bookmark the permalink.